The folks at the Arcata Playhouse found themselves in a bit of a bind today. As you may have read in the Hum last week, they'd booked a show for tonight with the NYC neo-honky tonk band, The Sweetback Sisters, who are coming west for this weekend's High Sierra Music Festival. At least they thought they'd booked the band, via an email exchange with a booking agent. Unfortunately the agent did not find enough Sweetback gigs to warrant the early arrival, something the Playhouse did not learn until last night. Since the Water Tower Bucket Boys were coming down from Portland to open, they could not just call the whole thing off. Absynth Quintet to the rescue! Apparently unwearied by a recent road trip, the fleet-fingered pickers stepped in as a replacement. If you miss it, you have another chance to groove with AQ Saturday night as the quint headlines a benefit for the Petrolia Volunteer Fire Dept. over the mountain at the Mattole Grange in Petrolia, where "shift happens." The Way Out West Boys and The Tyrannosaurus Mess (I'm guessing Petrolia locals) open the show. Also, if you want a preview of the Water Tower Bucket Boy set, they'll be at Missing Link Records this afternoon at 4:30 for an instore. Due to a scheduling problem, the Sweetback Sisters will not be appearing at the Playhouse on Tuesday night. Instead, local favotrites Absynth Quintet will share the bill with the previously scheduled Water Tower Bucket Boys. We apologize for the trouble. If you have purchased tickets already you will be able to use them for this show or get a refund at the door. Please spread the word if you are/were planning to attend. Use the code word "Oops" at the door for a $10 ticket to the show. Dispite the disappointment in not having the Sweetbacks, we are thrilled to have Absynth Quintet coming to the Playhouse. They are just returning from a California tour that finished at the Freight and Salvage in Berkeley and they have a very hot new CD, IOTA just out. A bionic string band? Fire breathing traveling gypsy circus indie grass? Acoustic, with benefits? 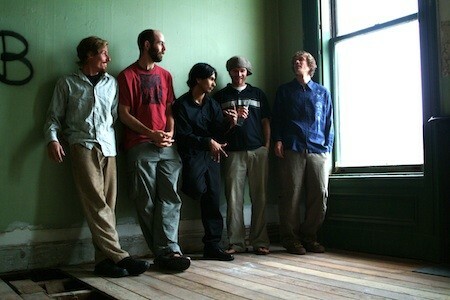 The Absynth Quintet is a group of pickers purveying a truly unique brand of high energy acoustic music. The band's sound, born and cultured in the fertile hills of Humboldt county, California melds a reverent treatment of time-honored american music, with a reckless, virtuosic and often zany approach to innovation. There's something Django-esque, something distinctly eastern European that saturates many of the songs, but always present is the foot-stomping influence of the bluegrass roots. The Absynth Quintet certainly isn't averse to classic bluegrass comparisons, they just want to make it clear their musical range doesn't stop at the Kentucky border. Mixing it up somewhere along the spectrum of acoustic-improvisational-gypsy-jazz, their sound is plucky and tight à la David Grisman, but adds a dash of Eastern European exoticism. Tell your friends and join us for this special surprise show!